It’s this time of the year, the holiday season, where friends go back to Canada and very kindly offer to take something back for me. In the past, I would gladly accept their offer and ask for crunchy peanut butter or a specific brand of cookies. You know, the kind of comfort food which can be useful when you live abroad on your own. Having now lived nine out of the last fourteen years in Europe, I still have to find decent peanut butter on the old continent. Not that I am actively looking since I have given up peanut butter about a year or so ago. As a result, when friends asked this year whether they could bring something back for me, I couldn’t think of anything. I am quite happy with everything that Europe has to offer food-wise. But beside peanut butter, there are a few things that are much better in North America. What? you ask. Well, hamburgers for example. As a side note, this is a reminder to European readers that hamburgers are not supposed to be eaten with a fork and a knife. Something else? Muffins! Although, things are improving, at least in this part of Europe. 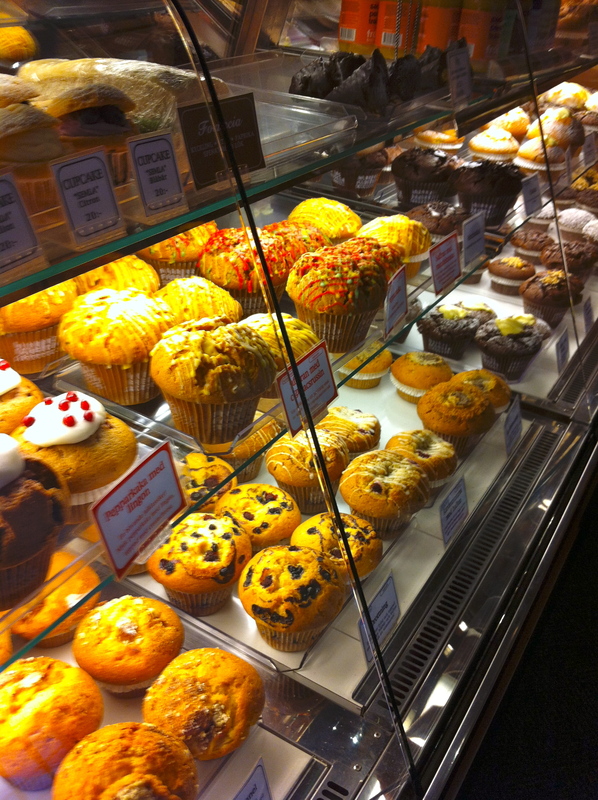 I have already blogged about the Muffin Bakery. And I am very happy to report that I have now found Muffins Fabriken! Located on Götgatan at the very southern tip of Södermalm, just before the bridge to Hammarby Sjöstadt, Muffins Fabriken could be easy to miss. But those who have been there know better, and they probably keep the place running. Muffins at Muffins Fabriken come in two sizes: large and huge! 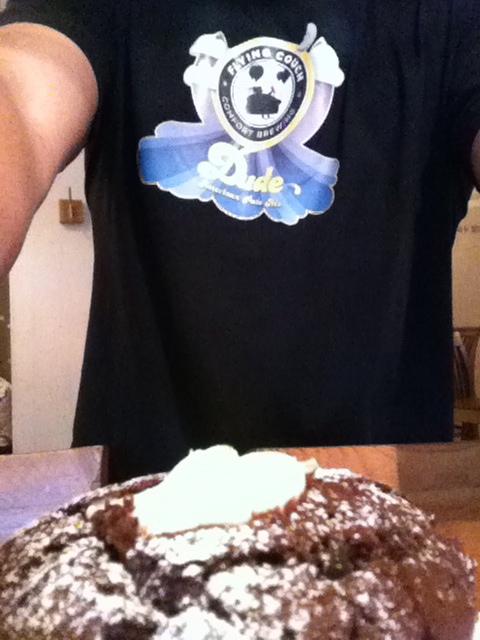 And if size matters as far as muffins are concerned, I was quite happy with large. I went to Muffins Fabriken a couple of days before Christmas so I had no guilt feelings at all with my double chocolate muffin with vanilla. 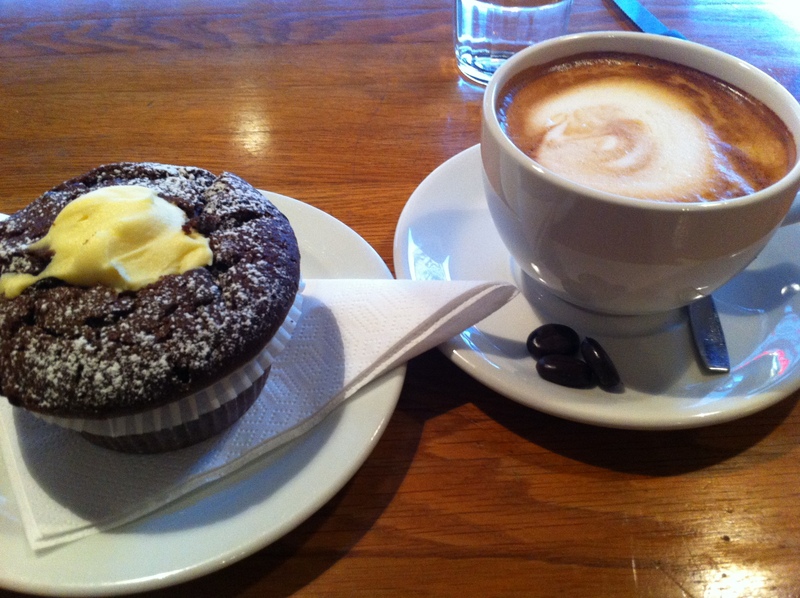 I also had a cappuccino with the muffin, but to be honest I can only remember the muffin today. I am pretty sure the cappuccino was ok, otherwise I would remember! 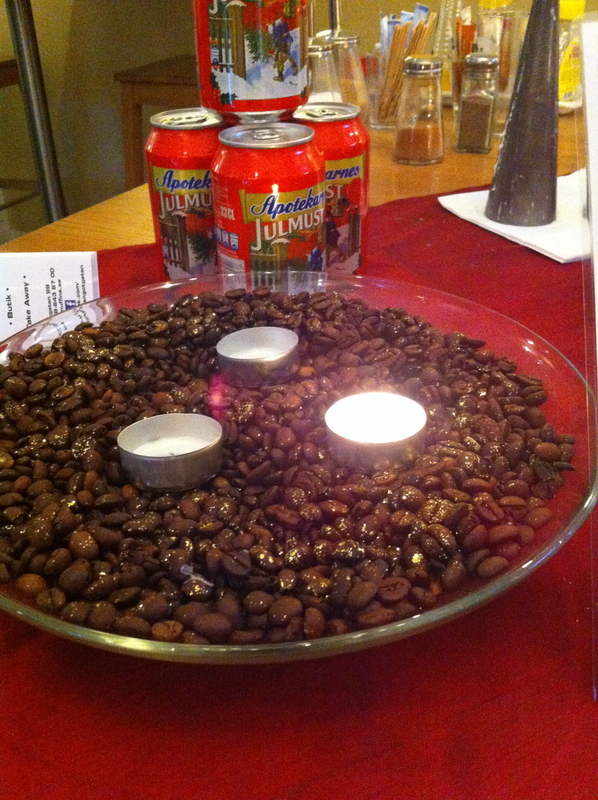 I do remember the nice coffee beans shaped chocolate served with the cappuccino. Very nice touch, even though I probably did not need anymore chocolate at that point! I tend to go to Hammarby Sjöstadt during summer time. I also tend to prefer muffins during winter time. Maybe Muffins Fabriken will become the perfect excuse to visit Hammarby Sjöstadt this winter. The muffin stop on my way there would certainly be a very good incentive. And if it’s really cold maybe I could stop on the way back too! 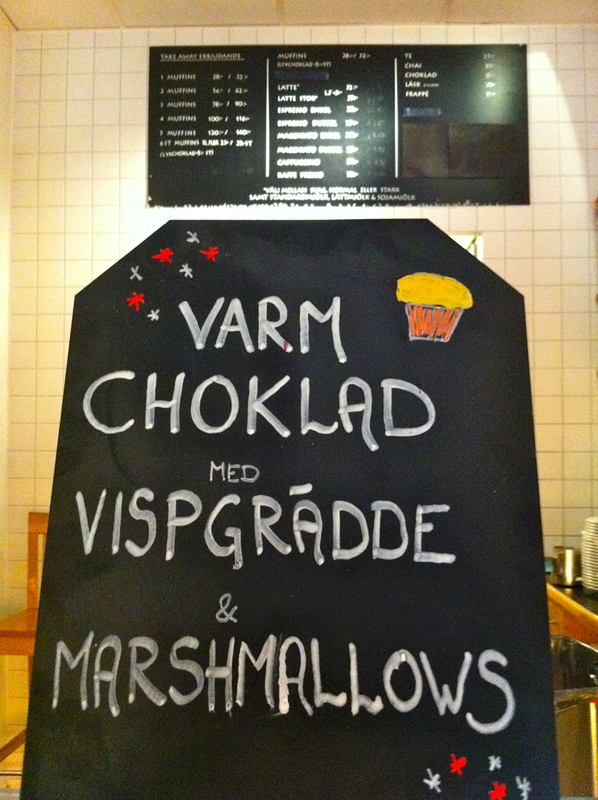 The hot chocolate with cream and marshmallows would be yet an another good reason to go to Muffins Fabriken this winter. As I sit in bed on this little morning of Christmas 2013 writing about muffins, I suddenly found the courage to get up and go to the gym. Sure, I enjoy running in itself. But I also enjoy eating and drinking, and in these times of excess, going to the gym might be a necessity more than a choice. Hell, if I train hard enough I might stop for coffee and muffins on my way back!